The earrings are only a couple of inches long, but the masterfully carved salmon look like they’ve leaped from the water to whisper in the wearer’s ear. Their glowing red hues and iridescent opalescence caress the eye. These colors occur naturally in the medium in which Leah Mata, a Northern Chumash artist, works: the shells of the red abalone, or Haliotis rufescens. A pair of abalone earrings made by Northern Chumash artist, Leah Mata. Abalone shells and the rich meat inside have sustained Mata’s people throughout their existence. And the Chumash are just one of the coastal Native communities for whom abalone holds a central place in culture and cuisine, and in jewelry, regalia and ceremonies. 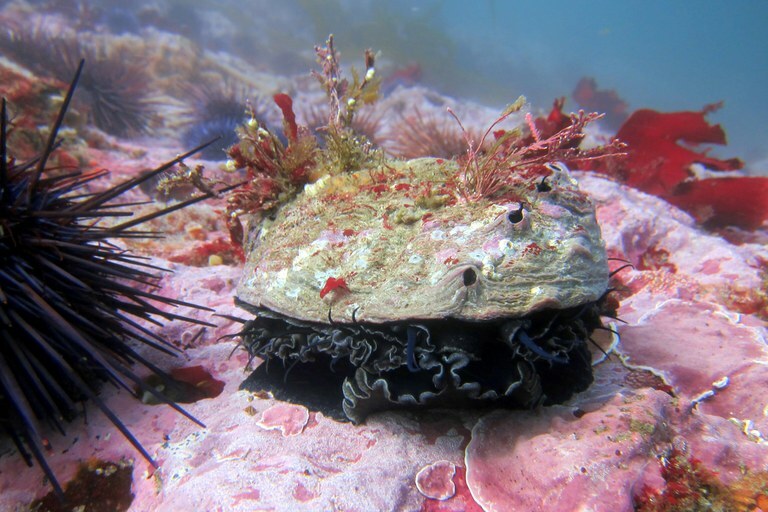 Now, however, a “perfect storm” of overfishing and climate change is driving the abalone perilously close to extinction, pushing the California Department of Fish and Wildlife to cancel the 2018 abalone fishing season. Although the ban poses potential economic harm to the estimated $24 to $44 million sport-fishing industry, it could spell subsistence and cultural disaster for the tribes. Since California tribes lack treaty rights or other federal or state laws allowing them to pursue their traditional lifestyle, they have little leverage to seek cultural or subsistence exemptions from the ban. 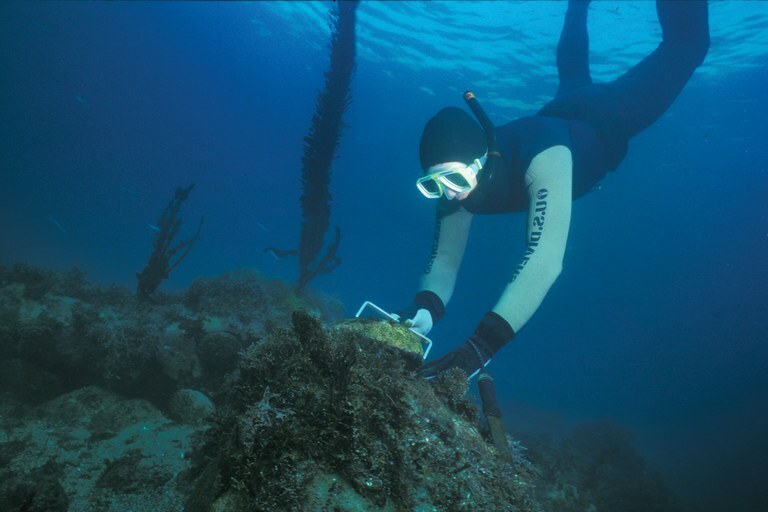 A diver measures a red abalone on the California coast. Abalone must be seven inches long or more to be legally harvested. For millennia, the 20 or so coastal California tribes have relied on abalone as an important source of protein, harvesting the shellfish at sustainable levels. Commercial fishing began in the late 1800s and gained intensity over the years. By the 1990s, several species had nearly been wiped out, prompting wildlife officials to halt the practice. Recreational fishing was permitted, but the harvest was strictly limited to allow the invertebrate to recover. In other states, tribal members typically can engage in subsistence activities outside recreational fishing and hunting regulations, thanks to sovereign territory rights, as with Alaska Natives who hunt seals, whales and other animals. However, since Congress refused to ratify the treaties negotiated with California tribes in 1851-’52, they lack subsistence rights and are subject to California wildlife and coastal management laws. A toxic algae bloom in 2011 and an unusual mass of warm water the following year caused a massive depletion of kelp forests, the principal food source for several coastal species, including abalone. And the kelp that survived faced a greater threat: purple urchins. After their primary predator fell victim to a viral disease, the urchins ate everything in sight, including about 90 percent of the kelp, resulting in today’s “urchin barrens.” McKay said that, when he dives, it’s like walking across purple carpets of urchins. “A big barren used to stretch a mile,” said Cynthia Catton, a marine biologist with the department, who studies kelp and abalone populations. This barren stretches for 100 miles, and the ecosystem may take decades to regain equilibrium. Poachers also exact a heavy toll. McKay says that state officials say poachers take as much, if not more, abalone than legal fishing each year. State authorities are trying to crack down, but when a single abalone can fetch $100 and up on the black market, stopping poachers is nearly impossible. A red abalone off the coast of California. 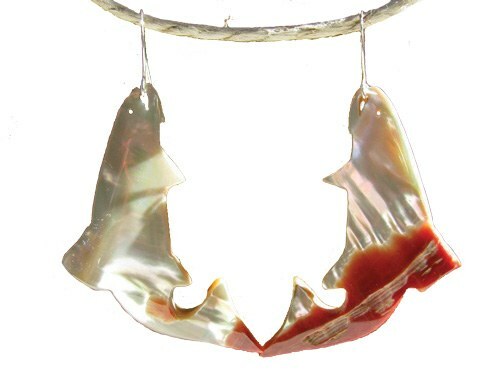 Mata says she may have to quit selling her award-winning abalone shell jewelry, which helps support her family. And given the reduced fishing seasons and takes, many tribal members fear that this tie to their heritage is in danger of being broken. Sonke Mastrup, an environmental program manager with the state wildlife department, says California can help Native artists find a reliable source of shells, using dead abalone on the ocean floor and shorelines. The agency may also be able to supply some tribal communities with small amounts of abalone meat from research labs. But that’s not enough for Mata and McKay, who worry they could soon lose a vital part of their culture, spiritual beliefs and history. Abalone shells adorn their regalia, and its meat has long filled the bellies of their ancestors as well as those of their people today. And even though tribes are represented on the California Coastal Commission and California Department of Fish and Wildlife, many Natives feel their concerns are drowned in the noise of a state with 39.5 million people. “Western culture has taken our cultural resources for themselves,” Mata says. All this adds up to a heavy cultural price. Note: This article has been updated to correct California’s population. It is 39.5 million, not 33 million.